Hi guys! Letting you know that the levels should be cleaned up and the subscreens modified. Added the Hookshot to the quest as well for continuity. Please let me know how this goes. Thanks! Alright, I'll admit I tried this simply because you didn't have any screenshots posted and I wanted to see what tileset it was in. Turns out to be an interesting adaptation of Z2 graphics into the Z1 gameplay style. Regarding continue points: you currently use the green arrival square rather than the warp return system. ZQuest should have given you a message when you first placed the green square on the overworld that it was obsolete and most quests now use warp returns as continue points. To enable that, go to Quest Rules -> Combos and check the "Use Warp Return Points Only" box. When you enable that, here's how it works: if you leave a DMap as level 0 and check the "Continue Here" box, you'll always start at the screen listed in the "Continue" field. Typical for overworlds. However, if you assign a DMap a level of 1 or greater, you'll always start at the last used entry warp regardless of the screen listed in the "Continue" field. Necessary for multi-entrance maps. If you don't have "Continue Here" checked, you'll start at the last used DMap with a "Continue Here" option set, regardless of what level number you give the DMap that doesn't use the continue option. Note that the continue point system is activated using the "Entrance/Exit" warp type - if you use another warp type, the system won't activate and you'll start at screen 00 regardless of the screen listed in the "Continue" field. Enabling that quest rule and reloading the game allowed me to continue at the location of the blue square in that area, and all the other levels as well. Additionally, starting there immediately warped me to another set of caves. When placing the warp returns for cave walk-down entrances, place them on the tile below the cave, not on the cave itself. That will allow the walk-up animation and sound effect to play when exiting, and prevent the player from immediately being pulled into the cave if they start in that location. Of course, the problem with this setup, perhaps ironically, is that you can't make screens like the Z1 start screen by default. Warp Return A is always the start point, but it's also the warp return that screen 80 uses, so you can't have a separate start point and screen 80 exit point on the same screen. 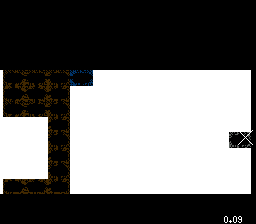 What you have to do for a screen like that is like you did with your underworld caves - make a copy of screen 80 on its own map and give it its own DMap so that it's basically a one-room level, then set its bottom side warp to use Warp Return B, so your starting screen will have the B square below the cave entrance and the A square where the player starts. 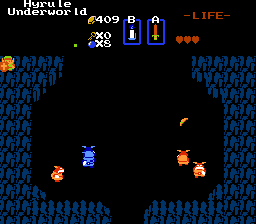 Also in that first underworld passage, the Hammer guy's cave is missing. I mean, he's there, and he gave me the Hammer, but I'm guessing you deleted screen 80 from the map because it's just a black screen that I can walk off from any side, and doing that can scroll me out of the level entirely. Anyway, it's been OK to play so far. I should probably give you a run-through of how it's gone up to this point, because I'm pretty sure I didn't do it the way you intended, but I have to go for now, so maybe later. Just wanted to point out the issue with the continue system first since it's pretty integral to quest functionality.